Dr. Dan Lange has been practicing veterinary medicine for over 30 years. He has served the needs of pets and their owners in the greater St. Charles area along with surrounding counties. He deals in companion animal medicine (primarily dogs and cats) but also deals with exotic animals such as ferrets, guinea pigs, hedgehogs, rats, and birds. Dr. Lange is a 1975 graduate of the University of Iowa with a B.A. in Zoology. In 1981, he earned his Doctor of Veterinary Medicine from Iowa State University. He is a member of the American Veterinary Medical Association and the Missouri Veterinary Medical Association. In his spare time, he enjoys running, swimming and bicycling. He is grateful for the wonderful pets he has met and the wonderful pet owners that allow him the honor of treating their pet at Elm Point Animal Hospital. 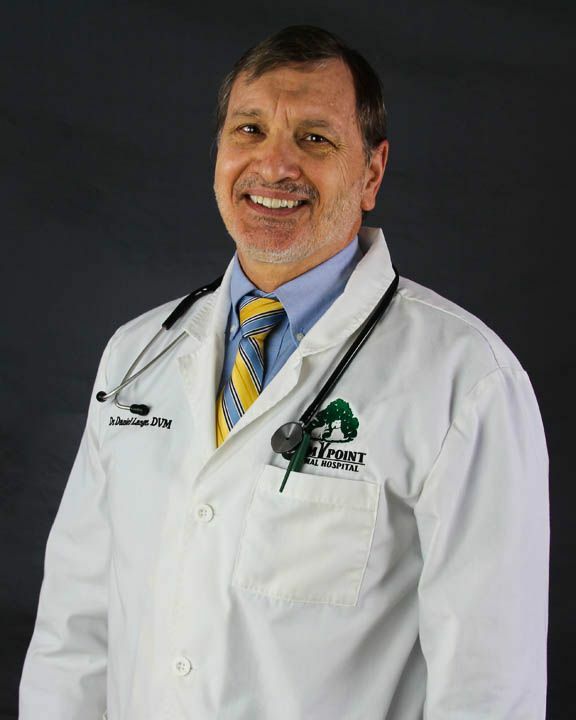 Dr. Michael Little has been practicing veterinary medicine for the past 15 years in the St. Charles community. Although Dr. Little grew up on an Angus cattle and row crop farm in Northeast Missouri, his interests have always remained in small animal medicine and surgery. In 1993, Dr. Little received his Bachelor of Science from the University of Missouri in Biochemistry. In 1998, he graduated with a Doctor of Veterinary Medicine from the University of Missouri Veterinary Teaching Hospital. In his spare time, he enjoys spending time with his wife, son, 2 daughters, their family cat Parasite (Paris) Hilton Little, and their dog Jaxon. He also enjoys travel, volleyball, and attending St. Louis Cardinals games. 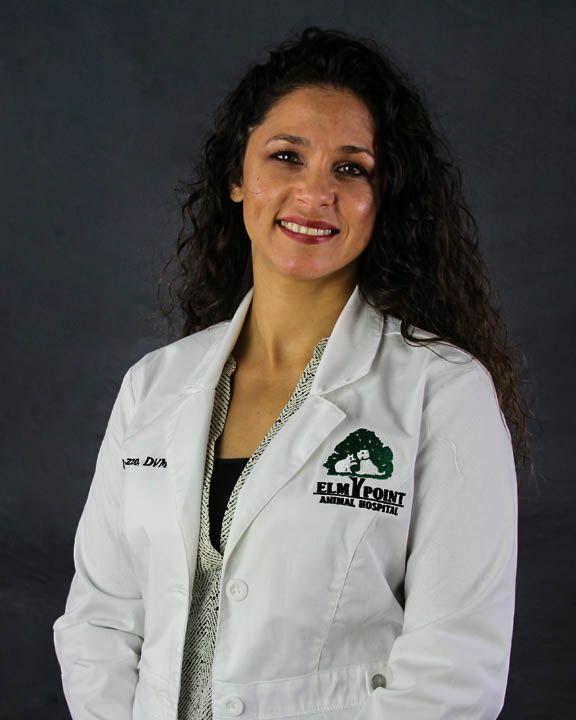 Dr. Little enjoys forming lasting relationships with clients and their pets at Elm Point Animal Hospital. He is also an active member of the American Veterinary Medical Association and the Missouri Veterinary Medical Association. 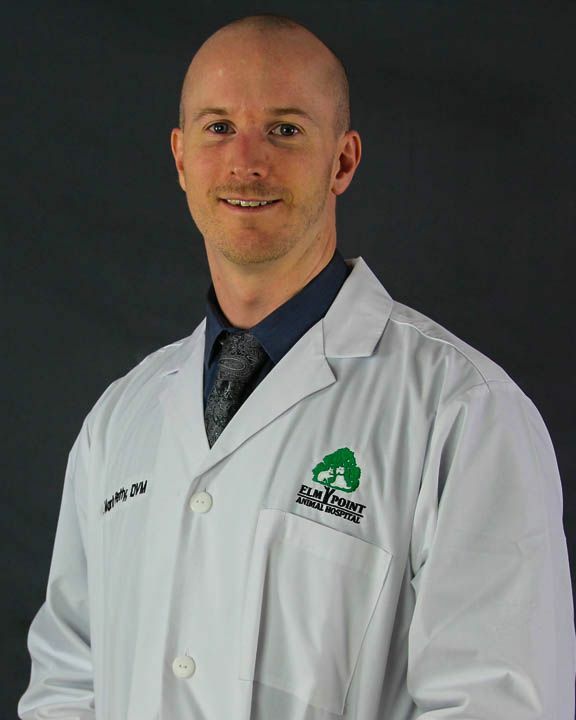 Dr. Mark Petty comes to Elm Point Animal Hospital with three years of experience in small animal medicine. 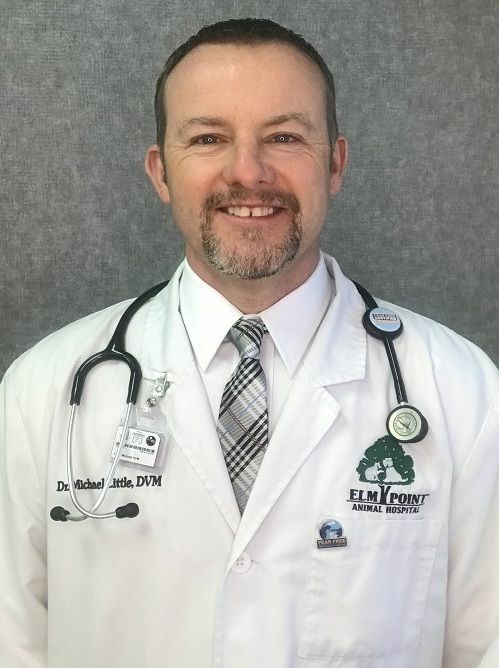 He was born in Florissant, Missouri and has served the St. Louis and St. Charles community by providing preventative care and therapeutic treatment to pets in need. He is eager to form lasting bonds with the people and pets of Elm Point Animal Hospital and is happy to be part of our established team. Dr. Petty graduated from the University of Missouri - St. Louis with a Bachelor's in biology in 2006 and received his veterinary education from the Royal Veterinary College of London, United Kingdom in 2012. Dr. Petty specializes in emergency medicine, but outside of work, he is an enthusiastic painter and sketch artist. He also enjoys hiking and mushroom hunting. Dr. Petty has always surrounded himself with animals, and currently owns too many cats to count! Dr. Angela Randazzo grew up in St. Louis and has been practicing veterinary medicine since 2005. She became interested in veterinary medicine while in high school working at St. Louis Hills Veterinary Clinic under Dr. Robert Schaeffer. Dr. Randazzo received her B.S. in Animal Science from the University of Missouri-Columbia in 2001 and graduated from Ross University in 2005. She has been married to her husband since 2001 and they have a son and a daughter and two dogs; Rooster and Josie. In her free time she enjoys cooking, gardening, listening to live music and spending tie with her family. Dr. Randazzo enjoys building relationships with her clients and her furry patients. 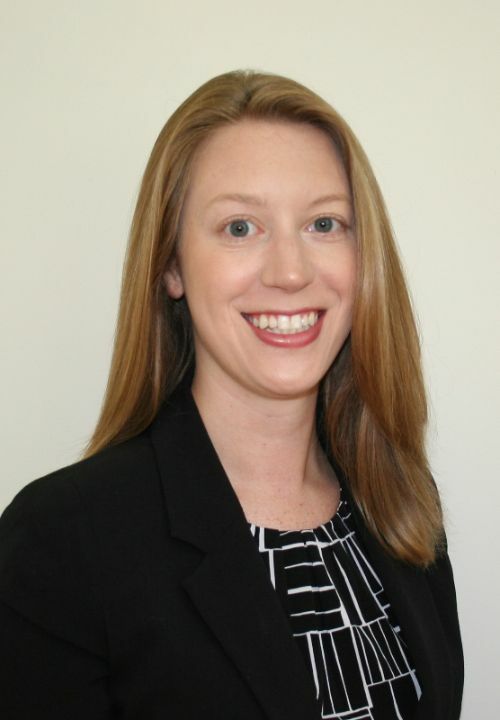 Dr. Melissa Georgevitch, DC is a native to the St. Louis area. She graduated from Logan University in Chesterfield, Missouri with her Bachelor of Science in Human Biology in 2014 and in August 2016 as a Doctor of Chiropractic. Afterwards, she pursued an additional certification at Options for Animals in Wellsville, Kansas for animal chiropractic. Dr. Georgevitch is a certified member of the International Veterinary Chiropractic Association (IVCA). Dr. Georgevitch has a longtime passion for helping animals. She grew up around a variety of animals including dogs, cats, cows, and horses. She has been in the veterinary field since 2009 and is very comfortable with all ages and stages of life. Dr. Georgevitch knew that being able to communicate with and treat animals using chiropractic care could have a positive effect on many pets’ health. She works exclusively with Veterinarians to provide the best care that her patients need. She takes pride in helping animals live life to the fullest! When not working, she enjoys being outdoors at her family farm, hiking, or spending time with family and friends.